all parts are cleaned scrupulously. 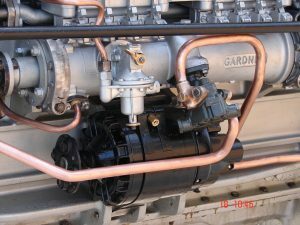 all new parts are genuine Gardner. injector pump reconditioned and recalibrated. blocks have new liners and professionally machined. crankshaft is reground and polished, with the damper plate restored. flywheel has new starter ring if required. heads are skimmed and new valve gear fitted. Internal parts get red oxide. 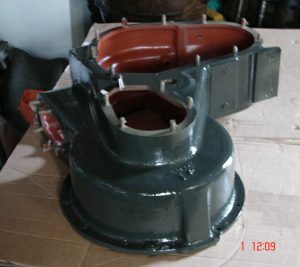 sump is dismantled and internals painted with red oxide. all parts given four coats of primer, then three coats of marine paint of customer’s colour. 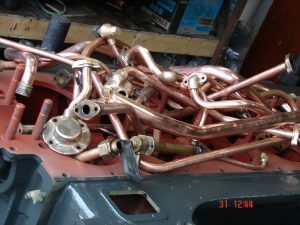 all copper polished and treated with industrial lacquer. engine reassembled, new shells, new gaskets and new bearings all round. all nuts torqued to Gardner standards. engine tested under load for 10 – 12hours. 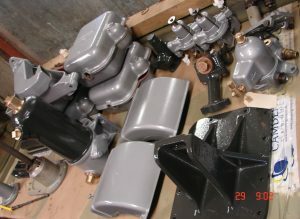 Between them our Gardner mechanics have over 100 years dedicated experience. Engines going abroad are professionally crated with both cleanliness and fumigation certificates.